Written by Mapline on October 10, 2017 . Posted in Blog, Updates. The biggest changes are here, and they’re taking the mapping experience to a whole new level! Since it’s Mapline’s goal to exceed the expectations of our users, here are the changes that we designed and developed over the past few months to bring you the best mapping experience in the most time-efficient ways. The first thing you’ll notice is that most of the features are now more accessible. This is because we have consolidated everything that can be added on a map into just one button. The “Add” Button menu includes adding pins, dataset pins, shapes, and boundaries. So if you are going to use these features, this is where you’ll go. What makes it even easier to use is the right click functionality for quick menu access once you’ve add them to the map. One of the most prominent changes that we’ve made has to do with our custom drawn shapes. 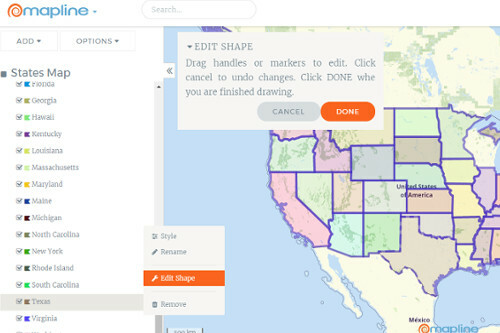 We’ve made it so much easier for you to draw polygons, polylines, circles, or rectangles on your map. They are also editable; you can name the shapes, hide them, or delete them in just a few clicks. This feature can also be found in “Add” button. Since we’re talking about shapes, the territory boundary shapes also have their share of changes. Like custom drawn shapes, boundaries can be accessed using the “Add” button. You will notice that when you add a boundary, you can now edit individual territory areas inside the boundary. For example, when you add a U.S. State boundary, you can choose to edit an individual state (California, New York, etc) like changing the boundary color, hiding or deleting them, or renaming them. What makes adding boundaries even better is the added option to change the fill color of the boundary without having to add a new boundary. Plus, if you’re coloring the boundaries based on a column from your dataset, the coloring will now be responsive. So the days of having to manually update your boundaries when your dataset updates are long gone! 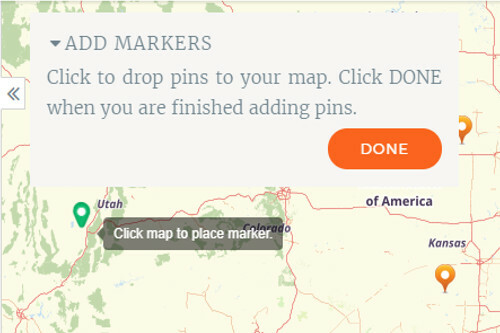 Want to add pins directly on your map? With these changes comes the option of adding pins on your map at the click of a mouse! It’s that easy! Just click your mouse wherever you want to drop your added pins. Changing the way your map pin looks like is now more exciting with the Styling option. 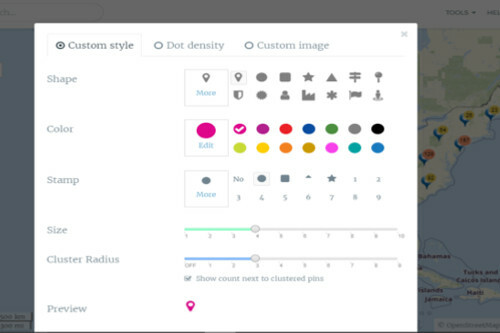 The “Styling” tab allows you to change the color, shape, stamp, and size of your pins. You can add custom images as your map pin. This is also the tab to click when you want to cluster your pins or create a dot density map. Filtering the pins is now made more powerful. Your map pins can now be filtered with different criteria. 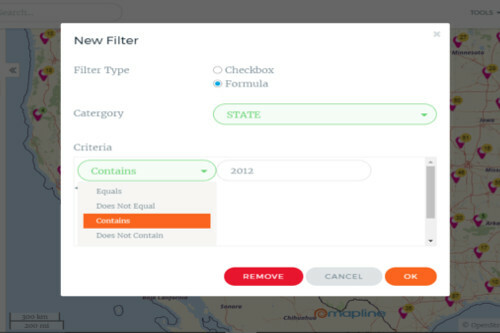 The Filter Option allows you to choose a category to filter. Not only that, it now allows you to choose the criteria (equals, does not equal, contain, does not contain), add calculation, and use the AND and OR functionalities. Here’s how it works: For example, you only want to see the map pins that are essentially: belong to a specific sales representative. Or you want to see only the map pins (locations) with $500K in sales (regardless of sales rep). Now, you can show both at the same time! The “Tools” Menu is now located on the top right corner of the screen. The “Tools” Menu includes the Excel Add-in and Distance Calculator. The zoom buttons can now be found on the right side of the map. Looking for “Sublayers”? Click “Segments” and you will notice improved functionalities. Since Mapline is on par with the growing demands of technology, especially when it comes to using mobile internet, we want to make sure that Mapline is mobile-friendly. Along with the changes that we’ve made, you will quickly notice that adding datasets, drawing shapes, and editing data, are just some of the things that you can do on your mobile device. And we’re not just talking about doing these things easily. You can also do them fast! Ask us and we’re always available to help you when needed. Our Live Chat provides instant help as you build your map. It is located under the “Help” tab.